Vancouver Canucks defenceman Alexander Edler has a concussion and will be out at least a week after a scary fall Monday night in Philadelphia. "Obviously a scary incident," Green said. "Medical staff I thought did a great job getting out there as quick as they did, and we're thankful that he's going to be all right." Edler's stick got caught in the skate of Flyers winger Jakub Voracek in the first period Monday night, causing him to lose his balance and slam into the ice. 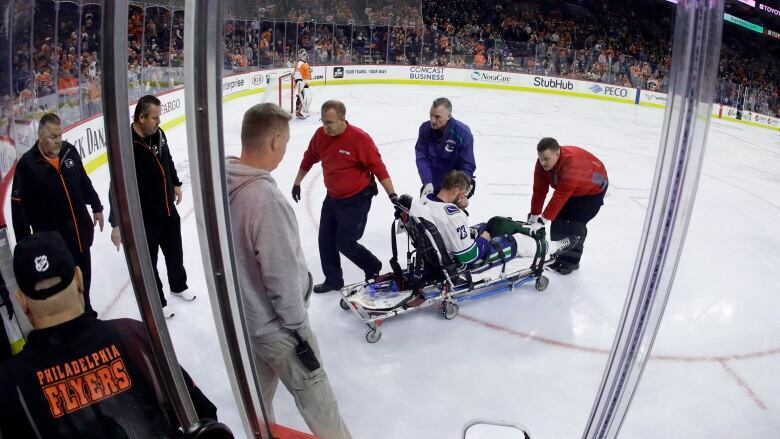 Edler lay motionless on the ice before being wheeled off on a stretcher. "You don't want to lose your top guys," Green said before facing the defending Stanley Cup champion Capitals. "He's a big part of our team. It's what it is. Teams face injuries a lot. He's one of our best players on our team. He's a good player."